Danny O'Brien is confident he will have a runner in Tuesday's Melbourne Cup, although he is leaving it late with De Little Engine. The focus for O'Brien is the Cup, although his appeal in the long-running cobalt inquiry will come to a conclusion next week. "I have just been concentrating on training and hopefully we can get this horse into the Cup," O'Brien said. "He is in good form and capable of running a good race, the other stuff will take care of itself." De Little Engine hasn't passed the first ballot clause for the Melbourne Cup, his ninth in the Caulfield Cup was one place from clearing the ballot condition. Therefore he will try to use Saturday's Lexus Stakes to move up the order of entry. "It was a good run in the Caulfield Cup and we didn't realise until later that he would have passed the ballot if he had finished eighth," O'Brien said. "That was disappointing but he is looking for the 2500 metres and loves Flemington, so he should get the job done on Saturday. "We have been aiming at the Cup since he won the 2800m race on Melbourne Cup day last year (pictured) and we always planned to run in the Lexus because he races best [at Flemington]. "If he can run in the first three he should get into the field and he will be running if he does." O'Brien was delighted to engage Hong Kong-based jockey Chad Schofield for Saturday and he will also ride in the Melbourne Cup if things go to plan. De Little Engine worked over 1800m at Flemington on Tuesday morning and has a preference for the long stretches of his home track. 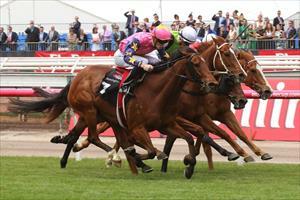 "He has always been a Flemington horse and he is a real stayer, the further the better for him," O'Brien said. "It is a bonus to get Chad back riding him because before he went to Hong Kong he had a great record on him and knows him well. "In fact his last three rides on him have been wins, so when I knew he was coming back I wanted to book him." Schofield is back to ride Seaburge in the Cantala Stakes, but De Little Engine could be a handy bonus. Tom Melbourne and The Bandit are the other two horses, which paid up for the Melbourne Cup on Monday without having cleared the first ballot clause and have to win the Lexus to gain the exemption from the ballot. There are still question marks over a couple of horses that comfortably sit inside the field, including Tally, Real Love and Howard Be Thy Name, which runs in Wednesday's Bendigo Cup. Michael Moroney has decided not to start Vengeur Masque on Saturday, although he is No.28 on the order of entry after running eighth in the Caulfield Cup. "We will just hope that he gets into the field, if not he can run in the Queen Elizabeth Stakes on the final day," Moroney said.